Monday was bad news too for Paul Maurice in Carolina: he lost the Hurricanes’ room for the second time in his career, for a total of three rooms lost overall, if you count Toronto. Bobby Hull and Bill Hay were a couple of specific Black Hawks in the 1963 room whom Rudy Pilous was supposed to have lost. When the oracle came true and Pilous was fired that week in May, Hull was quick to deny any such thing. 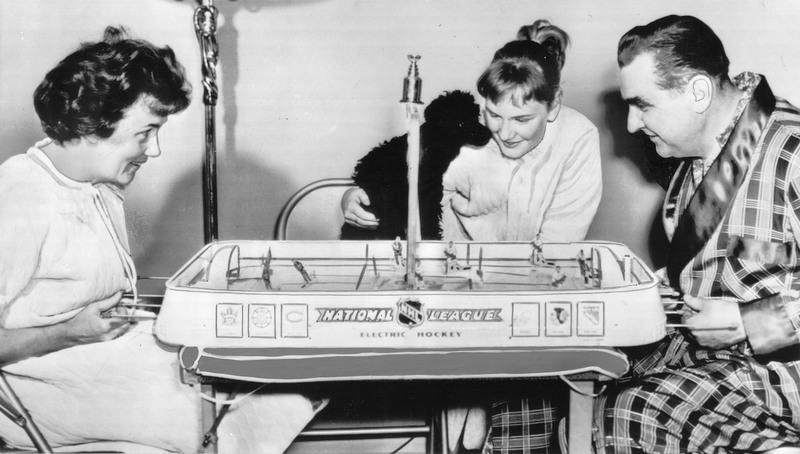 “If a bunch of grown men can’t get up for the game themselves,” he said, “it’s not the coach’s fault.” At home in St. Catharines, Pilous (above) took over temporary control of a tabletop Toronto Maple Leaf team. That’s his wife with him, Margaret, handling Detroit, and their daughter Mary Lou and dog Bijou in the stands. Pilous said he was disappointed but not surprised to have been dismissed. Billy Reay replaced him. 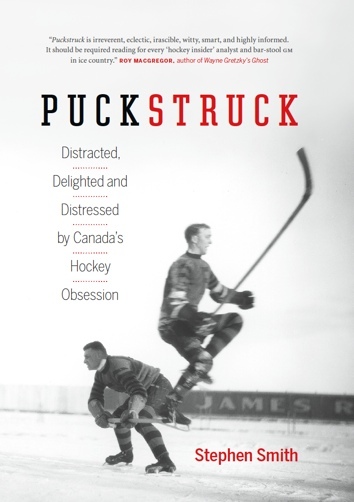 When he’d been let go, previously, by the Leafs in 1958, he felt he’d been undermined by g.m. Punch Imlach. “It may be that Reay didn’t have the horses,” Imlach countered. “But we don’t think he was getting the maximum effort out of the material at hand.” In Chicago, Reay lasted 13-and-a-half years, until 1976, when he gave way to three of his own players who’d been out with long-term injuries: Bill White with assistance from Stan Mikita and Bobby Orr. Montreal general manager Bob Gainey said that the players had stopped listening to coach Guy Carbonneau in 2009 and, furthermore, “the team was not emotionally engaged,” so what choice did he have but to let him go with 16 games left in the season? Tom Renney (2008) and Andy Murray (2006) were said to have lost roomsful of Rangers and Kings respectively. When Ottawa’s John Paddock lost his job in 2008, captain Daniel Alfredsson said, on the tuning-out question, “I heard a few people ask that, and that’s b.s. if you ask me. It kind of bothers me.” Same thing in 2006, with the Philadelphia Flyers: the players said, no, sorry, you’re wrong, they hadn’t stopped listening to coach Ken Hitchcock. This was, of course, right before he was fired. Tommy Gorman was president of the Montreal Maroons in 1938 when he announced, midway through the season, that coach King Clancy had resigned and he, Gorman, would be taking over behind the bench. Clancy said: “I didn’t resign. I guess I was fired.” And went to visit his mother in Florida. I don’t know if it would have given Clancy any satisfaction to know that by the time the season was over, Gorman’s team hadn’t won any more games than he had (six) while losing nineteen to Clancy’s eleven. I don’t think so. Probably not. I think Clancy just must have felt bad that the team finished with their worst record since 1924-25. It was their last season, ever, as it turned out, never played another game, 1938 being the year that the room, and hockey, lost the Maroons forever.